Now that the holidays are over and you have probably done your fair share of overindulging, we thought that we would take you to a place that serves “healthy” fare. We are shining the spot light on The Sushi Bar in Del Ray. When Mike Anderson opened his restaurant he had a vision in mind that is much appreciated this time of year. No one under the age of 18 is allowed! Although the idea brought its own controversy, after months of kids and crowds, it is nice to have dinner away from all the commotion. 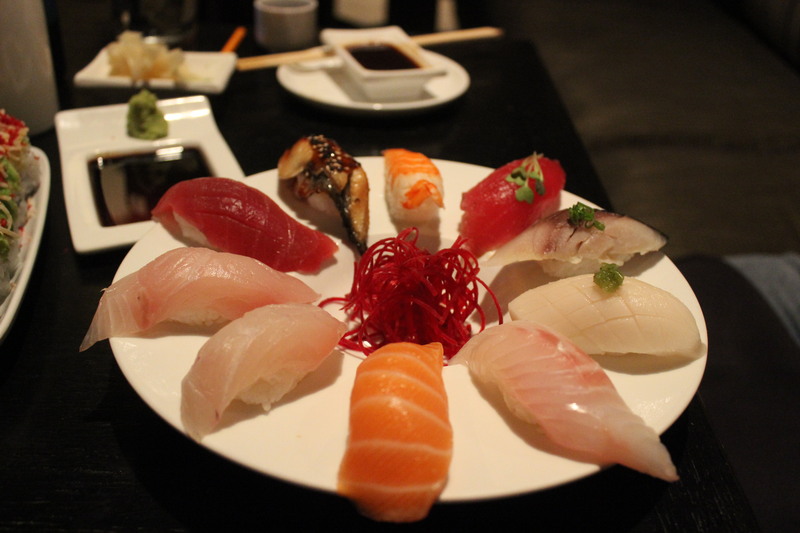 The Sushi Bar is located in the Del Ray neighborhood of Alexandria and provides a cozy lounge-like escape. There is a large bar with perhaps 20 seats as well as a 6-seat sushi bar. The dining area consists of square tables that seat two or three persons. In the lounge area of the dining room the seats and tables are shorter than normal which actually give you a feeling that you are sitting closer to the floor. 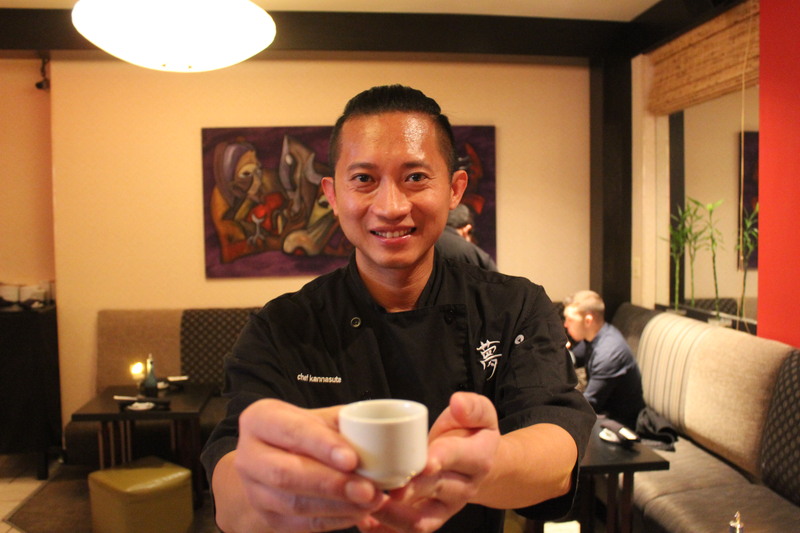 Prepared by chef Saran “Peter” Kannasute, their sushi and sashimi offerings are served on small “tapas-style” plates, which encourage guests to sample multiple dishes and to create their own perfect sushi experience. This bar is literally a “sushi bar”. There is no kitchen and everything is prepared out in the open. Our starters included the spicy miso soup, which is a Japanese soup consisting of a stock called “dashi” into which softened miso paste is mixed. This is a very tasty soup as well as good for you. We also had Edamame, a preparation of immature soybeans in the pod. The pods are boiled or steamed and served with salt. They are crisp and delicious. Other starter offerings include scallop salad, baby octopus salad, spicy sashimi salad, avocado salad and one of my favorites, seaweed salad. 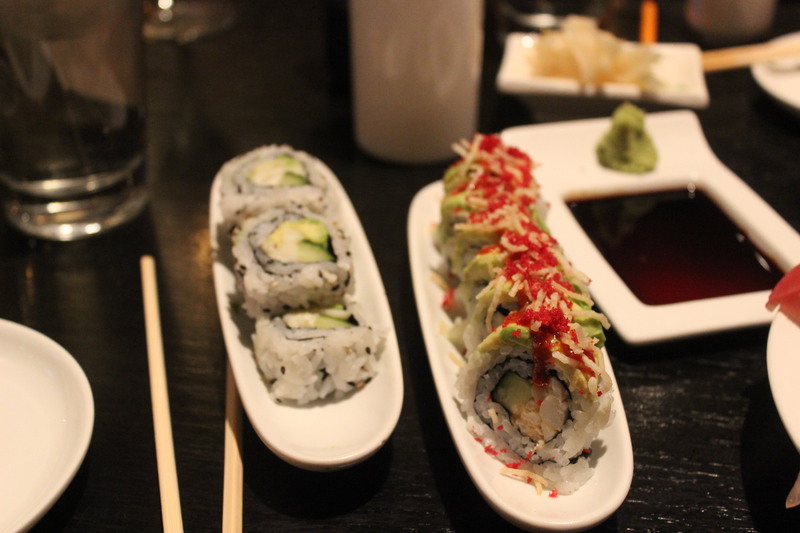 For my main course I had the California Roll and the Kamikaze Roll. The California roll contains cucumber, crabmeat and avocado. As one of the most popular styles of sushi in the United States, the California roll has been influential in sushi’s global popularity and in inspiring sushi chefs around the world in creating their non-traditional fusion cuisine. This was very good and the crispness of the cucumber could be tasted. The Kamikaze roll was a slightly different take on the California roll. In addition to the spicy crab, cucumber and avocado, there was a crunchy potato strips, red beet tempura and sweet chili sauce to top off the roll. This was very good as well and the crunchy potato made for a nice texture. One thing I particularly liked about both of these rolls is that the roll was sliced into smaller pieces than I am used to which made for a better dining experience…I didn’t feel like I was going to choke on a big piece of fish. All of the rolls run in the $7-$9 range making this a pretty affordable place to dine. My dining partner ordered the Sushi Dinner that features 10 pieces of chefs selection of Nigiri priced at $20. (They will customize the selections if you tell them there are certain fishes that you don’t like). Between the miso soup, the edamame, the two rolls that I ordered and the sushi dinner we were on full. However, Chef Peter insisted that we try his “special” honey ginger ice cream dessert. 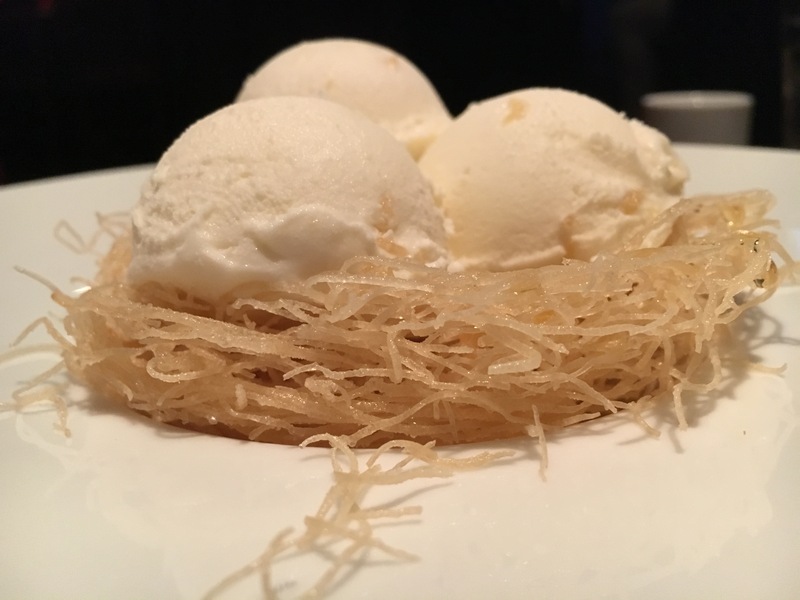 What a pleasant surprise when three small scoops of this delicious ice cream came served in a honeyed phyllo spun pastry nest! In addition to the regular bar cocktails, The Sushi Bar features a selection of more than 20 brands of sake in all price ranges. We opted for the house brand, Sho Chiku Bai. Priced at $11 it was enough for two people. In retrospect, I wish we would have tried one of the sake tasting “flights”. This would have been a great opportunity to compare the different styles and brands. Next time!! The décor is simple which gives the entire restaurant a clean, crisp feel. The staff were very attentive, knowledgeable and welcoming. This is definitely a place that we will frequent more often and take friends for an all adult evening. Although Del Ray is popular and very busy and street parking is sometimes a challenge, there is free parking in a lot directly behind the restaurant. Just be sure to turn the corner to the west off of Mount Vernon Avenue at East Oxford and take a look to your left – the parking lot is right there.